how do you tell kids about waste management? 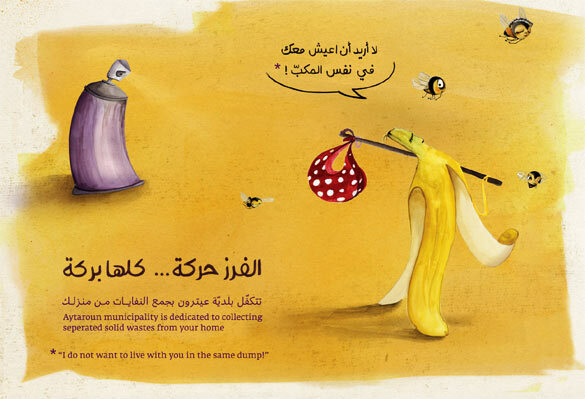 our customer, The Environmental Fund for Lebanon (EFL – GTZ) asked for a poster and flyer to educate the citizens of Aytaroun about waste sorting, recycling, and composting. more than that. we wanted to create a behavior change. instead of just telling people what’s the best way to go about things, we wanted the kids at school to take action in their homes. we wanted them to start the sorting from their homes. and posters don’t appeal to kids. kids like to interact and create. we proposed, designed, and implemented an interactive sticker-poster. 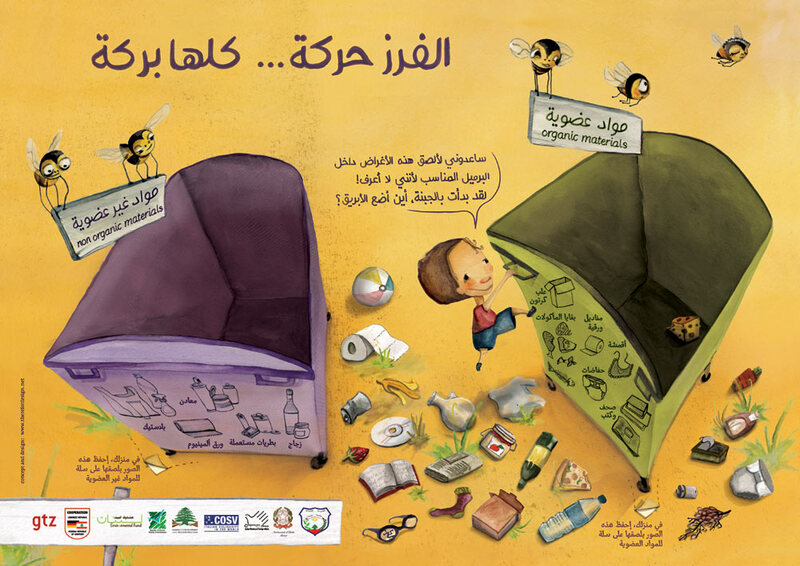 a poster where children could peel off various waste items scattered on the floor, and stick them inside either the organic bin, or the non-organic bin. 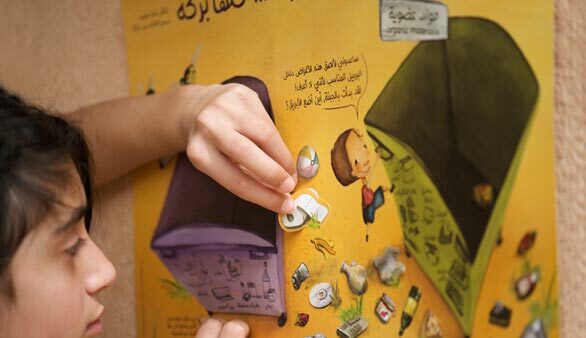 the kid in the poster is saying: “help me stick these stuff inside the right bin because i don’t know. i’ve started with the cheese, where do i put the water bottle?”. 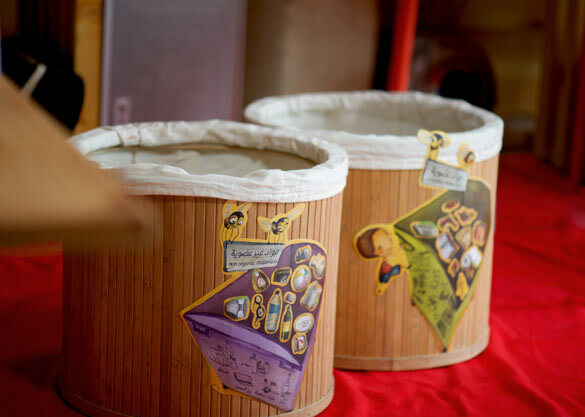 after all the waste has be stuck inside the right bin, we ask the children to peel off the organic wastes bin and stick it on a bin in their home for organic wastes. same thing for the non-organic. 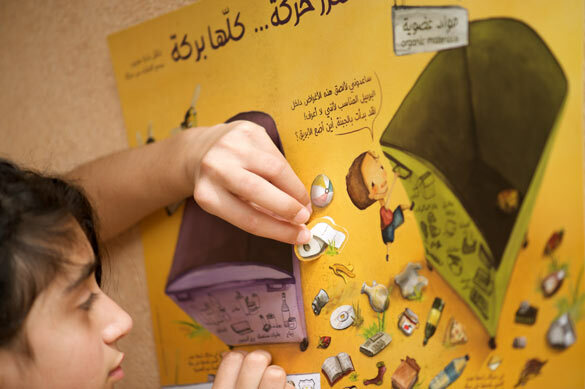 this appeals to children because they like to showcase their work, and this gives them the perfect opportunity. 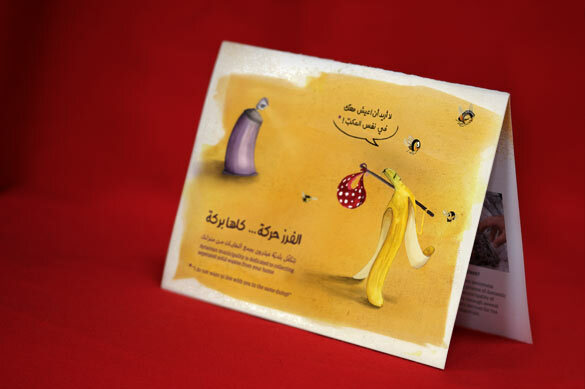 after the kids have already put aside 2 bins and stuck their masterpieces on, we targeted the parents with a brochure. a brochure that talks to the older age group. this way we entered the home from 2 fronts, and raised the chances of a long term behavioral change. the municipality of Aytaroun also goes the last mile, and is dedicated to collect all sorted waste from the homes. these are then taken to its sorting and recycling plant. Wow, What a fantastic collection. I love this. I love it. So beautiful, functional and creative. Thanks for Sharing…. Will, this is amazing. I love it. So beautiful, functional and creative. brilliant! 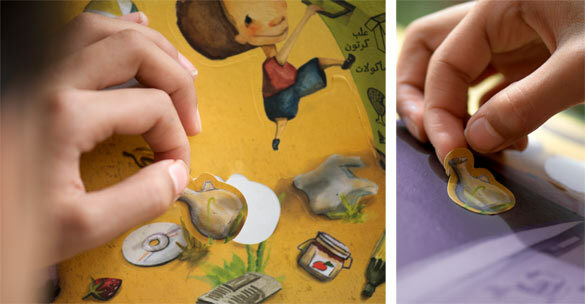 It’s indeed smart to have something interactive for children. Kudos! are the black and white drawn pictures the complete list of the stickers to use??? I completely agree with what you said in the first paragraph. the age group reaches up to 12 years old. there was no budget to target 0-5, 6-9, and 10-12 separately. so “most” of the objects are sketched on side of the bins. if they’re not, similar objects are. in the end it has to be challenging just enough. if it’s too easy they won’t be tempted to do it, nor get any satisfaction from doing it. If it’s too challenging, the effort might be more than the reward. the children will be completing it in class. so if anyone gets stuck, the teacher pitches in. some trainings are being given to the teachers on this. I love both ideas ur working on, and I love that u want to be a part of what we do for kids. I also want to be a part of what u do with those 2 ideas of yours. hanane loves to illustrate for kids if u like. and I’d love to challenge ideas, pick up fallacies, and take things to the next level; a little critical thinking 🙂 and I’d love to learn on the way. this is an open invitation for a creative collaboration space. I wanna be part of whatever you are doing for kids… MAFHOUM??? Dealing wiz children & finding a way to get through their minds is actually possible especially when achieving a genius idea as this.